Integrate Your Kids into Adult Activities - Joyful Toddlers! 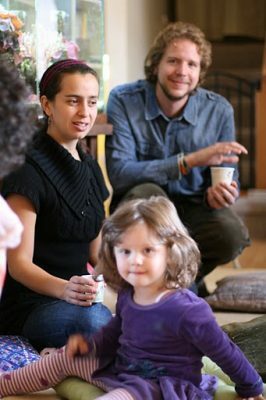 My husband, two boys (ages 3 and 4.5) and I recently moved into an intentional community where there are no other children. The other adults are welcoming but generally don’t know what to do, and my boys have started becoming more and more disruptive. I have turned to a very reactive way of parenting, always getting annoyed and whisking them away from adult activities as they get loud and silly: reverent morning circles, long drawn out meal times, meditative rituals are all ruined. I want to set my kids up for success and the others have asked me how they can help, but I don’t know how to go about it. Do you have any ideas on this? Anything would help. What a challenge, to be the only kids in a group of adults being “intentional.” The good news is that the other adults want to be involved with your kids; you should definitely take advantage of that. Instead of just hoping that relationship evolve on their own, I’d suggest inviting an adult for each child to be his special ‘Uncle’ or ‘Auntie.’ Arrange regular times two or three time a week where each child goes off with his ‘Uncle’ for a fun activity or just hang-out time. Once you all get used it it, this will provide the extra bonus of giving you a little time to yourself, or time with each child alone. Soon enough, these special people will also hold authority with your kids, and it won’t be up to you to be the one managing and whisking them all the time. Next, integrating them into quiet adult rituals and activities. One thought is to see whether some of these rituals might be done in song rather than in silence, and/or with movements rather than standing still. The children may be happy to go along with the rituals if there’s something for them to do instead of having to be still and quiet. For the next couple of weeks, when your morning circle (or another activity) comes, sit or stand just outside of it with your son on your lap. The two of you are physically removed, but you are in the circle with your energy and attention, and you help your son be in the circle energetically too, by whispering in his ear and pointing out what’s going on: “Look, they’re standing quietly in the circle. I bet they’re each thinking about how to be their best self today. Now they’re joining hands…look! Jill is lighting the candle. Ahhh….” This may be a little distracting for the other adults, but it’s got to be better than what happens now! In this way, you are both connecting with your son and being part of the circle at the same time. He is learning each part of it, what’s done, how long it lasts. Do this until your son has gotten used to sitting quietly through the activity and knows how each part goes, and then do it for a little longer. Then one day you might suggest, “Today, should we be a part of the circle?” (If he says no, then say, “Ok. I bet some day we’ll be ready to do it together,” and let it lie for three or four more days.) If he says yes, be excited but serious, and say, “I would like that! Let’s ask Jill –or whoever is the most ‘in charge’ person– if it would be ok for you and me to do it together.” Then, with some ceremony, go to Jill and ask formally if it would be ok for the two of you to join. Warn Jill beforehand, and have her ask your son quite seriously, “Are you ready to do what we do, while we’re in the circle together?” When your son says or nods yes, then she says gravely, “Then we would be happy for you and your mom to join us.” It is almost a process of initiation. Afterwards, if it goes well, make sure that the two of you connect over having DONE it together. Not with giddy excitement, but with solemn excitement: he is getting big enough to do these things with you! He may still need some days of watching with you, but he is growing into it. Does this sound feasible? This way you’re helping them grow into it and being excited when they can, instead of expecting it and being disappointed when they can’t. Good luck! This is a big deal for all of you, in your new community.